If you want to be successful over the Christmas period it’s vital that your website screams ‘stay here’. The longer a visitor stays on your site the more likely they are to book your services or purchase your products, not to mention the benefits to your search engine optimisation. So here are six tips to stop your visitors moving on to other businesses! A logo says a lot about your business and is one of the first things a potential customer notices. A logo hints at what you specialise in, your style and personality and who you are targeting. It also helps make your website stand out from the crowd and look great. There are many ways you can get a great looking logo. You can contact a design company and have a bespoke logo designed specifically for your business. You could design a logo yourself with the help of companies such as Cool Text. This is a really easy way of creating your own logo with very little technical know-how required. You could purchase specially designed software such as Logo Maker. You could purchase an ‘off the shelf’ but customisable logo from companies such as Etsy or fiverr which provide some really beautiful designs. Colour is a fundamental aspect of your business brand and subconsciously tells a potential customer a lot of information – from your photographic style to your target market. For example; women react differently to colours compared to men, while younger customers might feel differently around certain colours compared to the older generation. Simplistically, colours can be divided into two categories – warm and cold. Warmer colours are generally associated with energy, enthusiasm and fun (great for anything to do with kids or a buzzy atmosphere like proms or parties) while colder colours are more about calmness, security and maturity (perfect for corporate or wedding based businesses). Click here to find out more about colour psychology. Have you ever been on a website and been met with hundreds of buttons and lots of flashy, twinkly bits everywhere? Does it make you want to stay and take a look around? The general consensus is probably ‘no’. If you want potential customers to work their way through your web pages, read your carefully written information and look at all your beautiful images, you’ve got to make it easy for them. By all means include as many pages as you want but don’t just make a massive long line of links. Think about the design and look of your nav menu – use drop down menus, choose a nice, easy to read font (don’t go too far down the calligraphy road) and pick a lovely font colour. Little details go a long way. This should be pretty obvious, but for anyone who has let things sit on the back burner a little too long – your website content (this means text and images) should be up to date and of good quality. As human beings, most of us tend to feel more comfortable about booking a service if we know a bit about the person behind the company and know exactly what we’re signing up for. There is nothing worse than contacting a company and finding out mid-phone-call that for one reason or other they’re not the business for you. It’s embarrassing and awkward for both parties involved. So the moral of the story is – have a cracking ‘about’ page and ‘services’ area. Your ‘about me’ page should give an appropriate but thorough overview of you as a person. If you want to see some great examples of this check out Fiona Elizabeth, Trudi Scrumptious and Becky Kerr. These ladies have managed to sound friendly, honest and approachable while still telling you everything you need (and want) to know as a customer. Basically, they write in their own voice which is really important. Also, your ‘services’ page is going to be the thing that closes the deal with a potential client so make it concise, honest, thorough and clear. It should give a proper breakdown of everything you offer your clients – this can either be by photography genre (see Diana Steer’s pricing page for a good example) or by price-range package (take a look at Fiona Elizabeth for a really clear, minute-by-minute explanation). It’s true, your home page and portfolio are the most impactful pages when it comes to customers deciding if you are the right choice for them. However, that doesn’t mean your more informative pages have to be left barren. Website specific images are best described as set photographs designed to reinforce your photographic style and genre throughout your website as well as making your site more unique and personal. I truly believe that blogs are wonderful tools. They allow you to publicise your natural voice and show unique glimpses into the behind-the-scenes, VIP areas of your company. However just like your website, the more beautiful and user-friendly your blog, the more likely potential customers are to stay put. So aim to choose a neat, well laid out theme and to display your categories so that readers can find exactly what they’re looking for quickly and easily. Also add in a ‘related posts’ widget so that when a reader gets to the bottom of your blog post they find similar content. The more you can give your readers what they want, in terms of experience and content, the longer they’ll stay on your site. 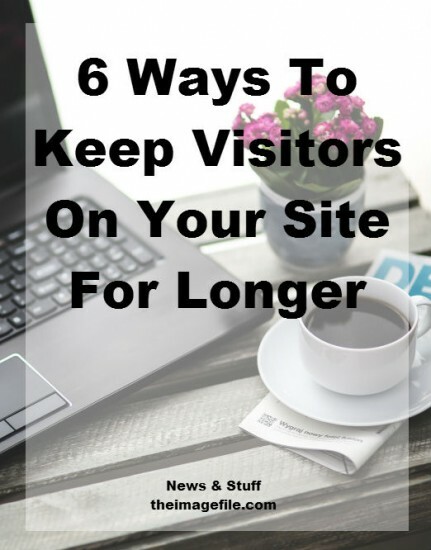 How do you keep your clients on your website for longer? Is there an area of your website that you don’t really know what to do with?